Occupational (License) Hazards: Style Hair at a Church And Go to Jail? [Madison, Wis…] In Wisconsin, a licensed beautician who styles the hair for bride-to-be and her bridesmaids at a church is a law-breaker. Technically, a stylist could face fines or jail time for doing hair or nails outside a licensed establishment, according to state licensure laws. 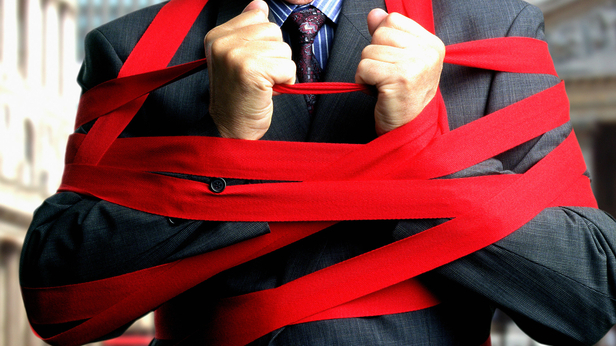 “If government regulation is so onerous that the average citizens doing common-sense things are breaking the law without even knowing it, doesn’t that tell you something about the state of regulation in Wisconsin?” said Sen. Chris Kapenga. The Delafield Republican wants the Legislature to take a serious look at the barriers to individual and economic freedom in Wisconsin. Kapenga and three other lawmakers – Sen. Alberta Darling, (R-River Hills), and Reps. Rob Hutton, (R-Brookfield), and Dale Kooyenga, (R-Brookfied) – are introducing a bill calling for a comprehensive review of Wisconsin’s occupational licensing laws, ultimately determining which licenses and regulations are necessary, and which are not. The Occupational License Review Council would be made up of gubernatorial and legislative appointees charged with “reviewing the validity of every license on the books and using an objective set of criteria,” according to a press release. Four members would be appointed by the governor, two by the Senate majority leader, and two by the speaker of the Assembly. The secretary of the Department of Safety and Professional Services or his designee would serve on the council as a generally nonvoting member. It must submit its report to the Legislature by Dec. 31, 2018. The council will “arm the Legislature” with the information needed to decide whether a regulation is truly necessary, versus the “one-sided” process that often goes into creating license standards. Recommendations could include the elimination of occupational licenses, the modification of laws and rules governing occupational licenses, and the reduction or elimination of continuing and other education tied to licensure. The Legislature would have to act on the council’s recommendations by June 2019, the end of the next biennium. After that the council would be dissolved, or “sunset,” but it would be revived every 10 years. There also is a “Sunrise Review” process using the same criteria to review any bill that would create additional licensing requirements. The bill has garnered several co-sponsors so far. Kapenga said he’s hopeful to move through the committee and public hearing schedules in the coming weeks and that the measure could come up for floor votes before the Legislature wraps for the summer break. Over the past two decades the number of occupational licenses in Wisconsin has increased 44 percent, according to legislative documents. Nationally, nearly 30 percent of workers need a license to do their job, according to a 2015 report from the Brookings Institution. Critics of occupational license reform insist public safety is at risk. They fear a kind of deregulated “Wild West” service industry, where poorly trained electricians set homes and businesses on fire and unscrupulous contractors are allowed to take advantage of trusting seniors. Kapenga and reform advocates say the fears are overblown, driven in large part by industry protectionists seeking to limit competition. Cosmetology licensure in Wisconsin requires at least 1,550 training hours in not less than 10 months in a school of cosmetology, according to state law. As reform advocates note, there has been renewed interest from across the political spectrum to reexamine licensure in the United States, with reform supported by everyone from the libertarian Cato Institute to the Obama White House. Kapenga’s bill is part of a suite of legislation aimed at occupational license reform in Wisconsin. A bipartisan bill moving through the Legislature would allow hair stylists, aestheticians and manicurists to practice their crafts outside a licensed establishment. Darling on Thursday introduced a bill that creates a self-certification process that sets up an alternative to the more onerous licensure process. Applicants would have to meet certain requirements set out by professional organizations in order to be certified. Americans for Prosperity-Wisconsin is a strong supporter of the reform measures, bills AFP says will remove barriers Wisconsinites face to obtaining their version of the American Dream. “Thankfully, two bills have been proposed that would greatly reduce these barriers to opportunity by making sure that any licensing requirements provide a clear benefit to society, not just protect special interests,” Bott added.